At the 67th edition of the International Motor Show (IAA) in Frankfurt, running until September 24th, Magneti Marelli technology has been chosen to fit out many of the new products presented by the most important international car manufacturers. First up is the new Maserati Ghibli, for which Magneti Marelli has developed a special full-LED Matrix lighting system with adaptive light-beam technology in collaboration with Maserati. This is an “intelligent” system managed by an electronic control unit, a camera and sensors which, through real-time communication, allows a continuous adjustment of the high and low beam patterns according to driving conditions. In particular, the high beam module includes the Glarefree High Beam Segmented Technology to avoid other drivers being dazzled. The front camera in fact allows for the detection of other vehicles in front of the car, or oncoming vehicles, and sends the information to the electronic control unit. The system automatically manages the LEDs, and switches them off selectively and sequentially, while maintaining an optimal illumination of the road, in order to avoid glaring. Then it progressively reactivates them as the car moves on. The system is able to create up to 4 independent dark tunnels, and restore complete full-beam mode once the road is clear. The full beam module is fitted with technology which adapts the width and range of the ray of light emitted according to road conditions and the speed of the car. According to the situation detected, the electronic control unit adapts the intensity of the light beam between four options: town light (up to 50 km/h), country light (between 50 and 110 km/h), motorway light (over 110 km/h), adverse weather light, varying the intensity and inclination of every single LED module. It also provides for the automatic switching on of the lights at night. Lastly, the system is fitted with a function that automatically activates when the car takes a bend, in order to allow for a better illumination of lateral driving lane and of the verge of the road. 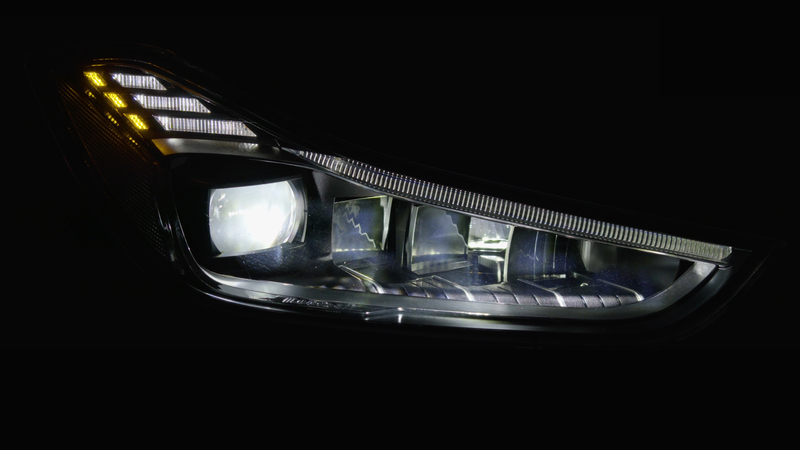 The functioning of the full-LED headlight for the Maserati Ghibli is illustrated in a dynamic video made by Magneti Marelli, available for public viewing on the Maserati stand. As well as the lighting systems, Magneti Marelli also supplies the Maserati Ghibli with the instrument cluster, the GDI system pump for the 3.0 V6 petrol engine, and the shock absorbers. Magneti Marelli Automotive Lighting is very much present at the Frankfurt auto show. The third generation of the Porsche Cayenne makes use of a completely LED rear lighting system, with the lights connected by an illuminated strip which crosses the boot and which carries the Porsche logo. The Mercedes S Class has a full-LED Matrix lighting system with 84 LEDs. Magneti Marelli also supplies the front full-LED lighting system for the BMW X3. Full-LED headlights, which make use of dynamic functions to render night driving even safer, are present on the new Opel Insignia Country Tourer, while LED headlights equip the Opel Grandland X. The second generation of Dacia Dusters are supplied with Magneti Marelli halogen lighting systems with LED DRLs. For the Seat brand, a rear lighting system for the new compact SUV Arona, presented for its European preview in Frankfurt. Magneti Marelli LED lights and headlights for the Maserati Gran Turismo and Gran Cabrio. Lastly, LED technology for the headlights on the new Volkswagen T-Roc and Polo. Magneti Marelli electronic systems equip the Citroën C3 Aircross, with the Telematic box (T-Box), which allows the activation of additional services regarding connectivity. The instrument panels on the Porsche 911 GT2 RS and Porsche Macan are by Magneti Marelli, offering traditional-style clusters with circular elements providing all useful information to the driver. Body computers have also been supplied for the Maserati Gran Turismo and Gran Cabrio. The technology created by the company in the field of electronics also includes the secondary 8” display for the infotainment system on the Opel Grandland X.
Magneti Marelli powertrain solutions have been adopted for the Audi A8, from the motorised throttle (3.0 V6 diesel and 3.0 V6 and 4.0 V8 petrol engines) to the air intake manifold for the powerful 6.0 W12 petrol engine. For Porsche, the company supplies both the motorised throttle present on the petrol and diesel engines for the Porsche Cayenne and Porsche Macan, and the GDI pump for the Porsche 911 GT2 RS. The motorised throttle and GDI system (pump and injectors) have been adopted for the new Volkswagen T-Roc and Polo models. The Seat Arona has also chosen Magneti Marelli for the motorised throttle and the GDI pump and injectors. The Citroën C3 Aircross is fitted with a Magneti Marelli motorised throttle. Lastly, a GDI system and motorised throttle for the new Skoda Karoq. Magneti Marelli designs and produces advanced systems and components for the automotive industry. With 86 production units, 14 R&D centres in 21 countries, approximately 43,000 employees and a turnover of 7.9 billion Euro in 2016, the group supplies all the major carmakers in Europe, North and South America and the Asia Pacific region. The business areas include Electronic Systems, Lighting, Powertrain, Suspension and Shock Absorbing Systems, Exhaust Systems, Aftermarket Parts & Services, Plastic Components and Modules, Motorsport. Magneti Marelli is part of FCA.